What a year! First, I’d like to say thank you for the enormous response and continued support for the blog. As you can see, the site has gone dormant for quite some time (even without posts- there are still a couple hundred of you that visit daily, thank you!). The reasons for this are too numerous to name, fortunately all very good. 2014 has been the incredible, both professionally and personally. I capped off the year making the Financial Times 100 LGBT List, a wonderfuly humbling achievement which I’d like to thank all my colleagues at Sky for creating an environment that celebrates everyone bringing their authentic selves to work. Separate to that, this year I celebrated 7 years in remission from cancer- I’m still kicking about and causing good creative provocation everywhere I go. Two great moments this year to reflect on. One thing is for certain- there is certainly a hunger for creative debate, sharing, and conversation around the work, the work, and the work. Expect to see more in 2015. PS. Please do leave me a message either here or through the other numerous channels (@dennytu). I’d love to hear from you, old and new friends alike. 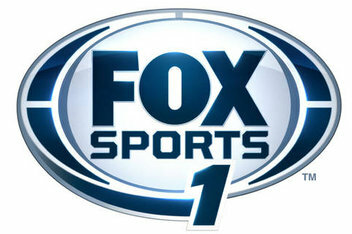 America’s newest sports network, Fox Sports 1, officially launches 17th of August. The new channel, part of 21st Century Fox, will broadcast live sporting events including the UEFA Champions League, the UEFA Europa League, NASCAR, MLB (in 2014), and UFC. The channel replaces Speed. You’ll catch a glimpse of the first image spot for the ambitious channel tomorrow night during the 5th inning of the MLB All-Star Game. Joseph Kahn directs an ultra-slow mo fest of beauty and battery, a few famous faces make an appearance in Joe Flacco of the Baltimore Ravens, UFC champ Georges St. Pierre, St. John’s coach Steve Lavin and (why not) Mike Tyson. I’m sure this spot will stir up some more lively debate around the differences between US & UK creative approaches. Enjoy. Twelve weeks ago, old friends/colleagues Aporva and Simon over at London-agency DixonBaxi began working on a new project with UKTV to create the brand for their latest free-to-air station, Drama. The heart of the brief was to “create a new home for Britain’s best-loved classics”, with the station airing a treasure trove of such shows such as Pride & Prejudice, The Cinder Path, Sharpe, Tipping the Velvet, Auf Wiedersehen Pet, Cranford and Lark Rise to Candleford. The brief included the need to have “the channel captured the nostalgic, warm, indulgent feeling of watching the shows whilst making sure the channel felt modern, fresh and was ultimately a celebration.” The classics ‘reimagined’ so to speak. UKTV Controller Emma Tenant explains, “The channel is aimed at people who simply love drama and want to watch critically-acclaimed shows that have absolutely defined the landscape of British television”. A creative strategy was developed which focused the positioning of the channel and also reflected the two sides to Drama. The shows set to air on Drama tend to take place in beautiful, pastoral landscapes, yet whilst seemingly serene, they often play host to a range of unsavory crimes, tragedy, romance, comedy and suspense. Looking at both the emotional and functional elements of brand, it was refined down to the overlap between the ‘idyllic’ and ‘intrigue’ and the natural tension that forms between these two narratives. The 10 idents, 14 channel stings and graphics package elements take place in everyday, real life settings. Warm, familiar, local. They feature a series of beautiful, cinematic single shots, which in combination create a sense of drama – always seen through our lens. Although familiar scenes, each has a delicious ambiguity which plays on the tension between ‘idyllic’ and ‘intrigue’. Music and sound design inspired by cinema creates a wider narrative context as well as warming up the imagery but with a moment of discord. The D logo was created as a premium mark and punctuation for the brand. The two dimensional into 3D form and the play between light and shade is also a reference to the two sides to drama and in our case the idyllic and the intrigue. Drama joins three free-to-air channels on UKTV: Dave, Really and Yesterday. FX, the home of True Blood, The Walking Dead, and Dexter in the UK, has rebranded as FOX. The channel looks to broaden its schedule beyond “edgy first-run series” to other genres as it looks to better serve its “ever-expanding audience”. The rebrand, which launched yesterday, marks a “natural evolution of the brand in becoming a bigger TV destination” after the channel achieved “record-breaking audience figures” earlier this year. FX attracted an average weekly reach of 4.07 million viewers, a 0.3 per cent share of the market in the week to 4 November, according to BARB. USA Just In: MTV stablemate VH1 has rebranded- new look, new shows, and a swanky hashtag (#plussed). The Viacom owned cable channel has said goodbye to “that” ol’ boxed logo and refreshed with a swath of new “celebreality” programming and a renewed focus on content led by popular American culture. What’s with the plus? A robot explains it far better than I could (and admits “the logo has finally caught up with who’ve they’ve always been”). Oh snap. Will you be attending PromaxUK’s annual conference this year? If so, come by and say hello. I’ll be chairing a session on Friday at noon titled “Let’s Stay Together” where I’ll be taking a look at some of the great marketing and creative partnerships in British telly. Joining me on stage will be a lineup including Reemah Sakaan (Network Marketing Director, ITV), Tony Pipes (Head of Creative, ITV), Simon Michaelides (Marketing Director, UKTV), Kjetil Njoten (Director of Creative, UKTV), Tim Hughes (On-Air Marketing Director, Discovery Networks UK), and Robin Garnett (Creative Director, Discovery Networks UK). The session is produced by the super talented team at BDA Creative. Oh and if you miss me at the session, catch me at the awards dinner/party where I’ll be holding court.